October 28 – 30: Edinburgh (subtitled Rest, Relaxation, and Time with Friends. October 28: On Saturday, we watched Outlander most of the day. We are both avid Outlander fans, but neither of us has Starz. So, we started with season two while we are here. (We saw season one a couple of years ago). In the late afternoon, we began to get ready for a party. 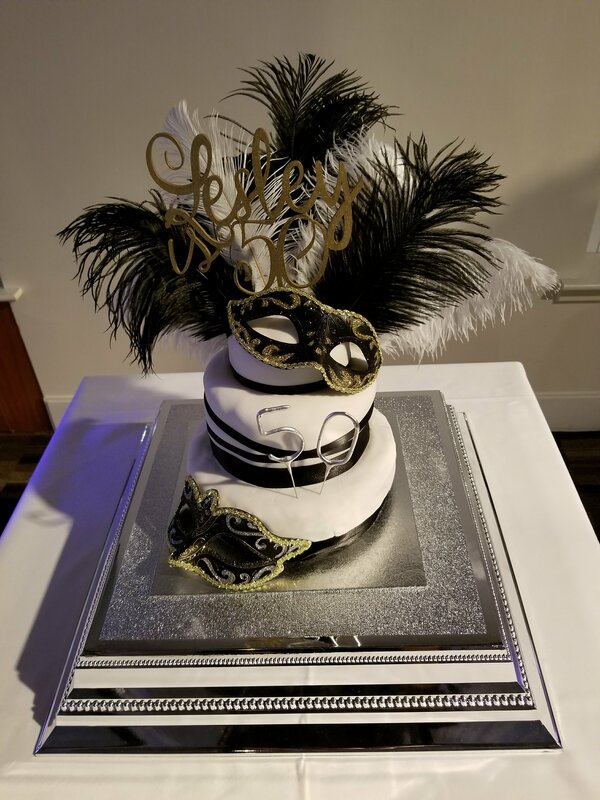 A friend of a friend (who is now our friend, it works that way) turned 50 and rented a venue for her masquerade ball to celebrate. 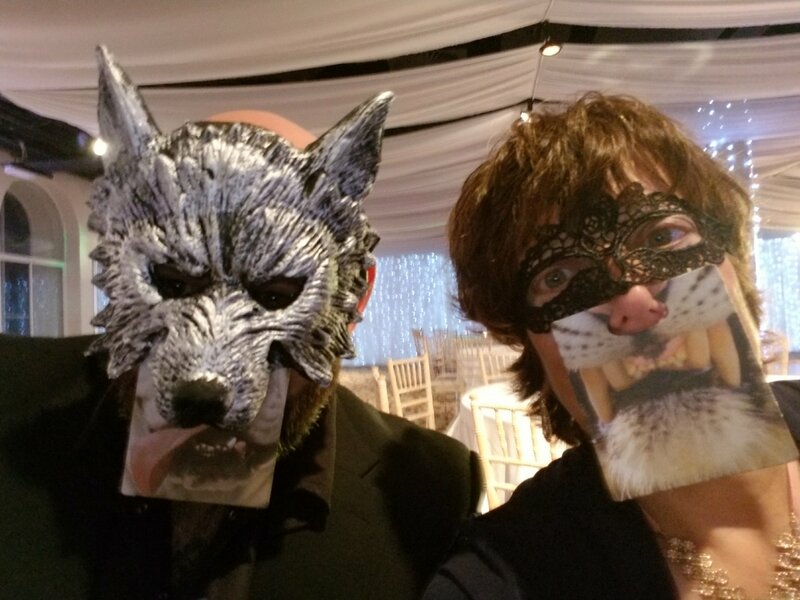 A friend picked up masks for us, but luckily we had each brought a dress, so we had something dressy to wear. We headed over, and had a great time at the party. It is always interesting to see the traditions that different places when there is a party, and live music. No Hokey Pokey, no Macarena, but in addition to a couple of new-to-us activities, there was the boat song. 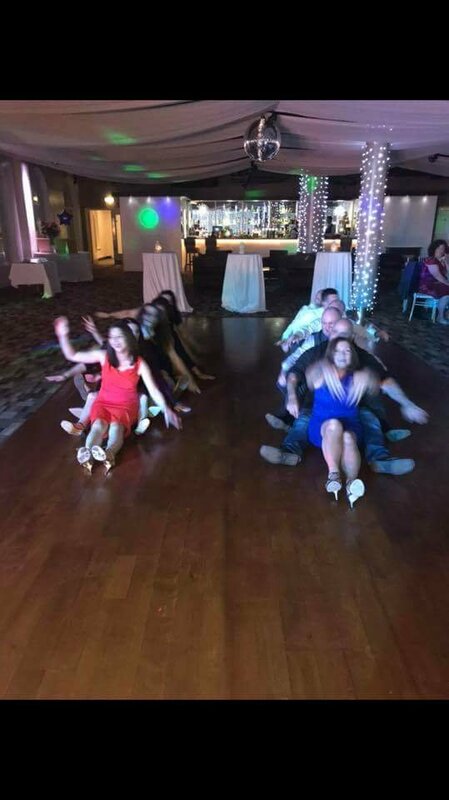 I don’t know if it has to be this particular song, but we divided into teams of men vs women, sitting on the floor in our “boats”, with our legs spread in a “V” with the person in front of us in our “boat” sitting inside the “V” of the legs of the person behind them. We had to do rhythmic movements together as a team that simulated the boat rowing left to right, and then forward and backward. I am proud to say that the girls got their rhythm in order sooner, and our “boat” won. Lots of fun! On Sunday, we slept in, and then made beef stew in the crock pot and watched Outlander all day. We got all the way through season 3 episode 6, leaving one episode to watch for Monday. 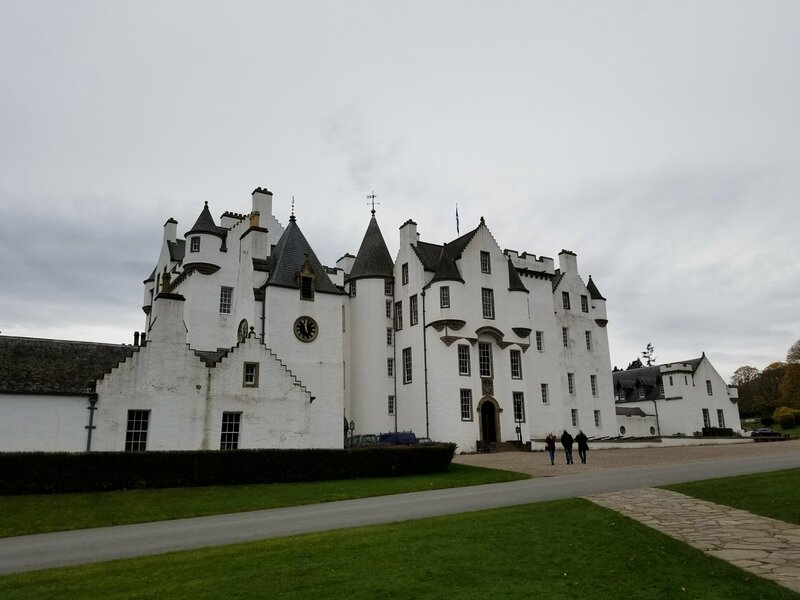 October 30: We got up a bit earlier today, and headed to Blair Castle in Blair Atholl, near Pitlochery. Blair Castle is the ancestral home of the head of the Murray Clan. The oldest part of the home dates back to the 1200’s, while most of the house was built in the 1700’s on. The first Duke was named in 1703, and the current Duke is the 12th. The family has a lot of history in Scotland, both in favor of the crown, as well as those odd family members who supported Bonnie Prince Charlie and the Jacobite cause. 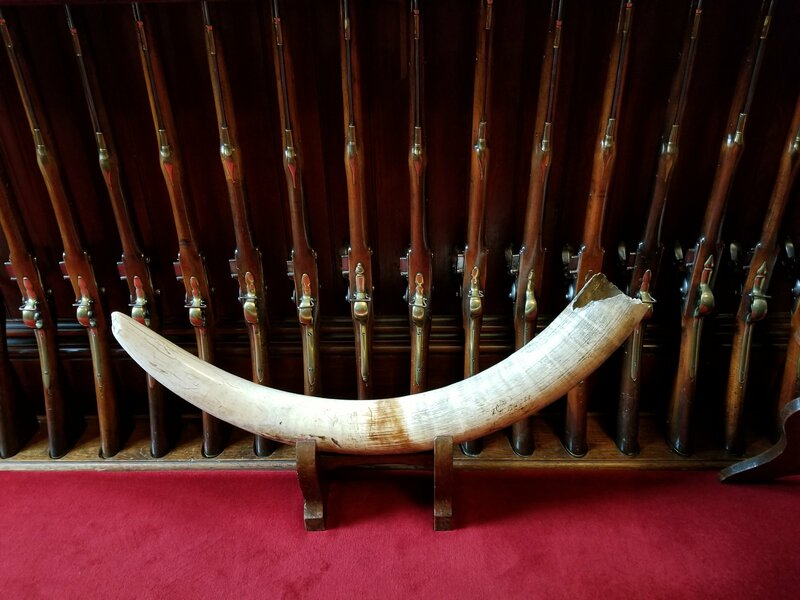 Many of the weapons housed in the armory that makes up the entryway of the home were used during the Battle of Culloden in 1746. In the 1840’s, the family hosted Queen Victoria. They put together a private regiment for her protection. She was so impressed, she gave them a charter, and they still are in existence today. The Atholl Highlanders is the only private army in Europe today. They are about 100 strong, and admittance is by invitation only. The family has done a great job preserving and displaying the history; it was a lesson in Scottish history as well. In World War I, the home served as a Red Cross hospital, and in World War II, it served as a school for children who had to be evacuated from Glasgow. On the way home, we stopped in Falkland. This town was used as the setting for Inverness in the opening episode of Outlander. The fountain where Jamie’s ghost appears, as well as the boarding house where Clair and Frank stayed on their second honeymoon, are there. We have one more day here, and while I am looking forward to the last leg of our trip Ireland, it is always bittersweet to leave old and new friends here. They take such good care of us whilst we are in their midst. 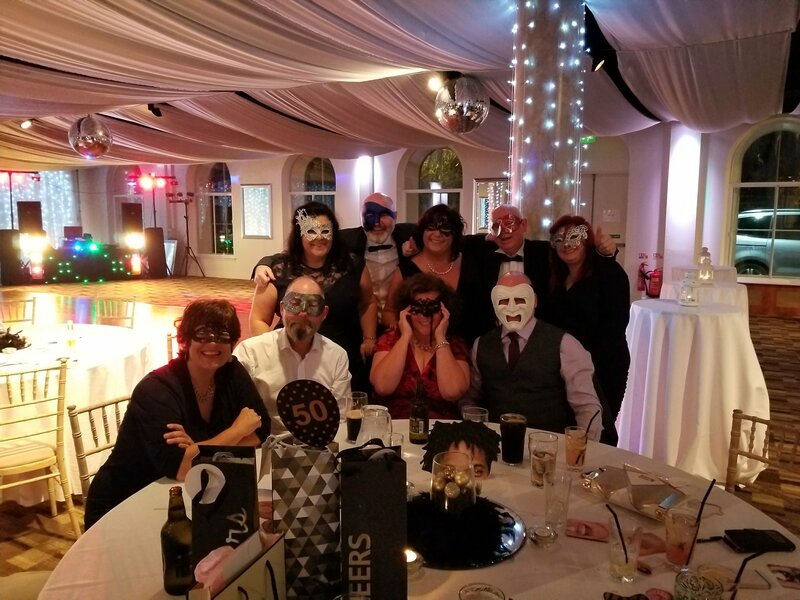 Scenes from a masquerade . . . 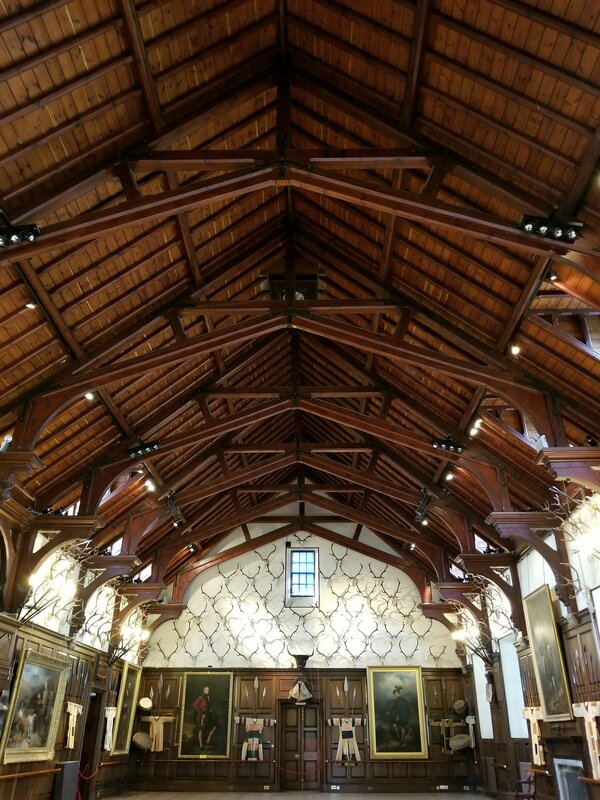 The ball room, the armory, and the exterior of the house. There was limited photography allowed in the home (only the ballroom and the exterior). You will see the antlers on the wall. There are no natural predators left to cull the deer herd that roams the estate, so the hunting season is crucial to their survival and well being. 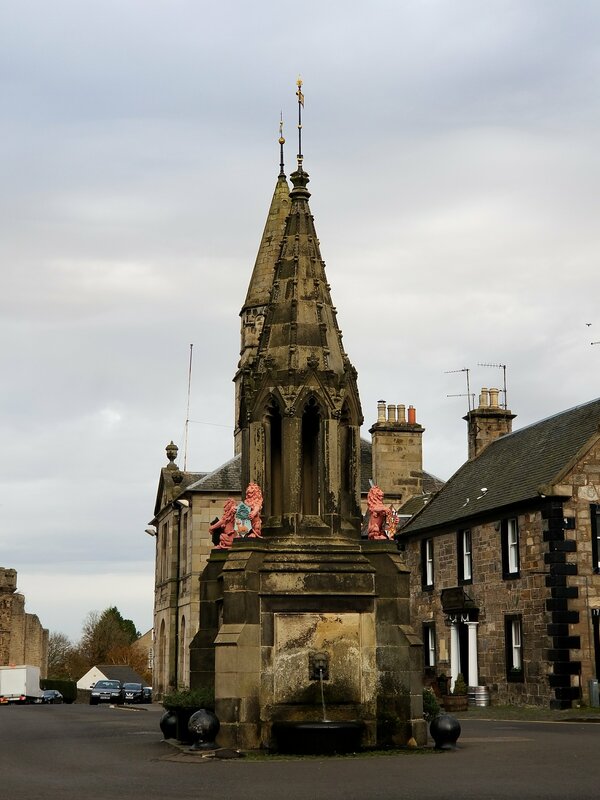 Here you see the fountain where Jamie’s ghost appears in the first episode of Outlander, as well as the place where Frank and Clair were staying (on the right). The lions on the fountain were stripped to their natural stone state during the filming, and then repainted. This entry was posted in Uncategorized by bohemianvirgo. Bookmark the permalink.